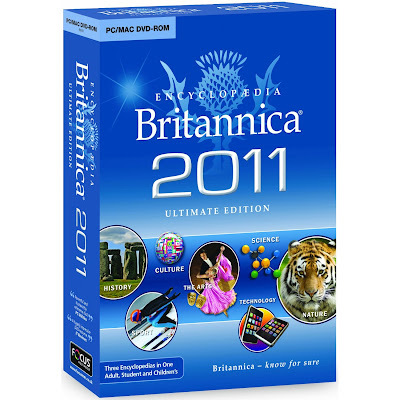 Owning the Encyclopaedia Britannica Ultimate Reference Suite 2011 is like having a complete reference library right at your fingertips. Its contents would easily fill a large bookcase - and now you can have this vast trove of information on your personal computer. With three complete age-appropriate Encyclopaedias, two dictionaries and thesauruses, rich multimedia, interactive article and media tours, homework tools, a complete atlas, timelines, online magazines, and more, the Ultimate Reference Suite is the knowledge you need from the world's most trusted source. Access the world's most trusted and authoritative information, featuring over 90,000 articles from the 32-volume Encyclop?dia Britannica print set. * Two Complete Dictionaries and Thesauruses from Merriam-Webster? Together, Merriam-Webster's Collegiate? and Student Dictionaries and Thesauruses provide access to 405,000 definitions, synonyms and antonyms. The ?Heroes & Villains? feature provides easy access to more than 600 biographies covering the world?s heroes and villains throughout time.